My week was wrapping up so nicely. My two-week stretch of being on call was coming to a rapid end. I was planning a celebratory dinner at my home for my team of hardworking students, residents, and fellows. I was the subject of a lovely interview on the kitchen generation, a beautiful blog written by a group of five über-talented young bloggers. It was announced that my recipes, along with those of several bloggers whose work I admire, were to be included on Gojee, a recipe sourcing site for the photographically-inclined. And finally, I held in my hands the print copy of my homage to Southern food, published in the Florida Times-Union newspaper. It was turning out to be a pretty great week. And then I got a text from my mom on Thursday morning, shortly after starting my hospital rounds. “I’m calling 911 now,” read her text. My dad had fallen backwards in his recliner the day before and bumped his head on the hard tile floor in my parents’ living room. The bump on the head might have been no big deal, but he was on Coumadin, a blood thinner. Shortly after the fall, he developed a severe headache, one that wouldn’t go away despite the multiple Tylenol tablets he took for it. The nausea and vomiting started soon after. He became confused. 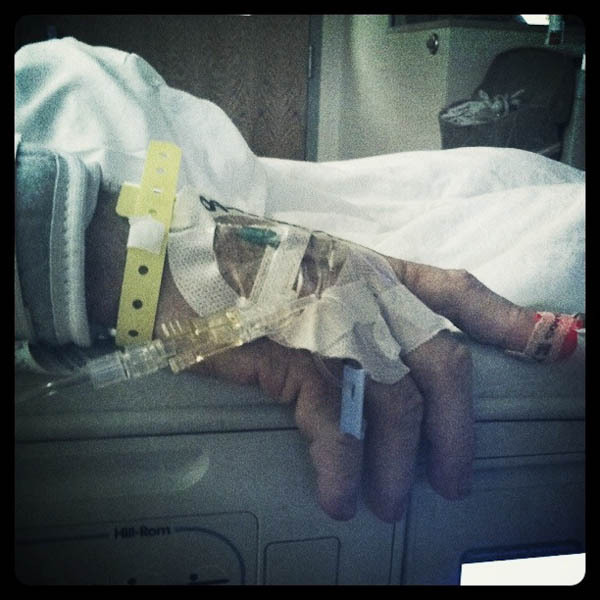 Then he wound up in an ambulance, and next, the emergency room at my hospital. A CT scan of his brain and blood work followed. The diagnosis was a subdural hematoma, bleeding on the brain. And this diagnosis bought him a stay in the neurosurgical intensive care unit. Things are looking up, though. He was transferred to a regular floor room on Sunday. The word from the physical therapist is that he’ll go to a rehabilitation center after his discharge from the hospital, something that my mom and I think he desperately needs. My children visited him yesterday, and though they hesitated slightly when they saw the various tubes and electrical leads adorning his weakened body, they gave him big bear hugs around the neck. And I made a pie. I’ve been waking up with pie on my mind, and I really, really needed to bake something. I made an all-butter pie crust dough last weekend, maybe because I knew I’d have Sunday morning to put it to good use. As I rolled the buttery dough into a flat circle, I thought about my dad and how his life – and my mom’s life – might be different after this past week. I was getting angry and frustrated, and I think the pie dough felt it. It fought my efforts, tearing around the edges, not behaving as I wanted it to. I gathered the torn pieces, balled them up, and decided to roll the pastry dough out again rather than start over. I cleared my mind, relaxed, and rolled it out again, slowly and methodically. It worked beautifully. Sand pears? Pineapple pears? 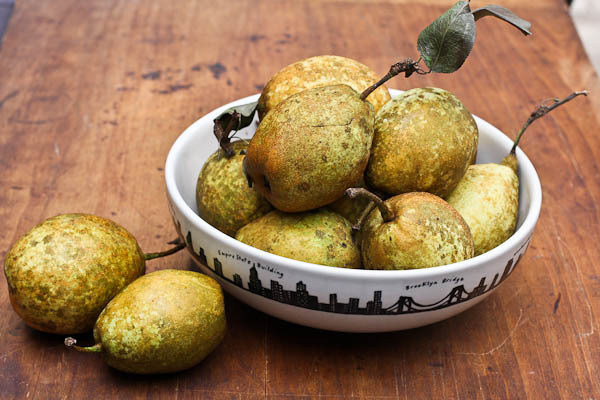 I just call them backyard pears. The filling was a combination of some Gala apples we had in the refrigerator and some of the green and brown speckled pears you see above. A friend of my husband gave us a huge bag of these pears. I thought a pie would be a wonderful way to honor that lovely fruit. 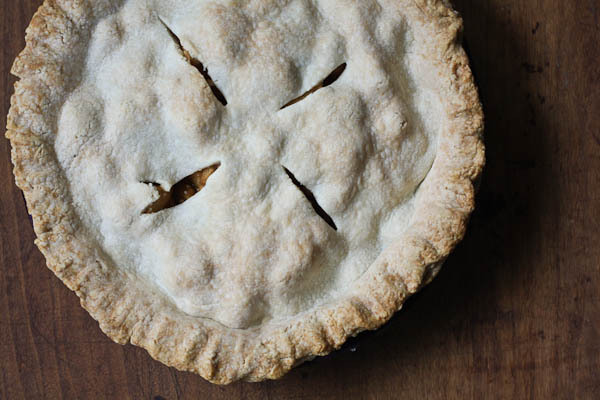 We’re starting our week with this apple and pear pie. I’m starting the week with a more clear mind. I think I’m ready for what these next days have in store. I used pears common to the north Florida region. I think of them as backyard pears, since I grew up with this type of pear tree in our backyard. You can use Bartlett or Bosc or any other type available in your local market. 1. Adjust an oven rack to lowest position and place a rimmed baking sheet on the rack. Preheat oven to 500 degrees. 2. In a large bowl, gently toss the apples and pears with the sugar, tapioca, lemon juice and zest, spices, and salt. Set aside for 15-30 minutes. 3. 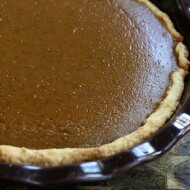 Roll out the bottom crust of the pie dough into a 12-inch circle and carefully fit into the bottom of a 9-inch pie plate. Spread the apples and pears in the bottom of the unbaked pie crust in the pie plate. 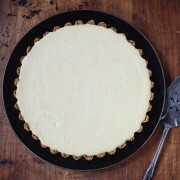 Roll the top crust into a 12-inch circle and place carefully over the pie plate, centered over the filling. Seal and crimp the edges of the pie crust and cut four vents into the top of the crust. 4. Place the pie on the heated baking sheet and lower the oven temperature to 425 degrees. Bake for 25 minutes, then decrease oven temperature to 375 degrees. Continue to bake for 30 to 35 minutes, until crust is golden brown and juices of the fruit are bubbling. Transfer to a wire rack and cool to room temperature. 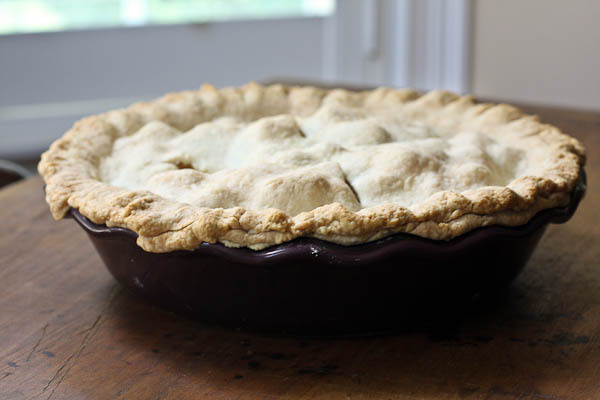 The baking method - starting the pie at 500 degrees, and reducing the temperature through the baking process - comes from the Classic Apple Pie recipe in The America's Test Kitchen Family Cookbook . Welcome back! I always love your writing, you have such a talent for telling stories. Lovely MJ. I hope my upcoming trip to Chicago is equally inspiring. I just posted for the first time in a long while and it was only a teaser post to a guest post for someone else but I’ll take it! At least I had to write the other post as well! Life happens a lot but patience is indeed a virtue as a busy working parent. Baby steps can be giant. Hang in there. Please. I don’t know why, but I have tears in my eyes now. It’s not the onions that I’ve just cut up for pizza, either. It’s because I love you and wish we lived closer to each other. You’d teach me to knit, I’d make cocktails for you. We’d laugh, we’d cry, hopefully, more laughing than crying. 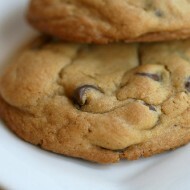 Maybe I’m just teary because you baked. Some days, I wish I had the stamina to post daily. But then I realize that diluted writing, writing done half-assedly, is writing better not done at all. I remember being at The Big Summer Potluck and sitting near the front and I believe it was during Brooke’s session (this was a few years back so my memory is faint) and one of my most vivid memories of that session was when you spoke and said that you have a book that is inside you…Years ago and that is what I remember when I read your blog. How great that you were able to spend time with friends and move in baby steps to that book that lives inside. Just great! I was happy to see you pop up in my feed…and baby steps are the best kind of steps. Just come back as you and when you are ready to share!